We're on the cusp of April, and it feels like we're coming out of our hibernation here in the Northern Hemisphere! Time to use those extra daylight hours to create beautiful and meaningful cards. We have a fun sketch today to jump start your creative play time! Below you'll find Sketch 274. Create cards, scrapbook layouts, home decor, treat containers, mixed media, etc. using this week's sketch and be sure to link your project below for a chance at the weekly My Favorite Things Gift Voucher worth up to $20. The My Favorite Things Creative Team has been busy getting creative! Let's see what they have up their sleeves for Sketch 274! Yoonsun sticks pretty closely to the sketch in her interpretation. The square, line, and star are all there! She uses the square as a spot to feature several of the images from the Terrific Ties stamp set, and her line is created with twine. The gold star is a fun finishing touch to her design. Julia tilts the sketch on its side for her take on this week's sketch. 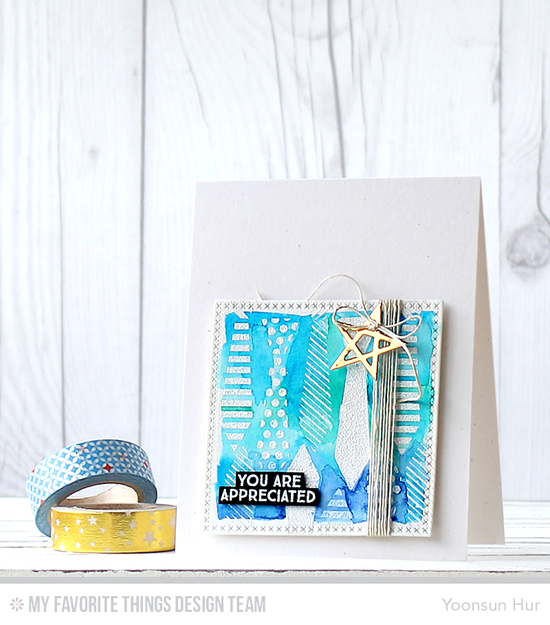 She uses the line as a spot for her horizontal sentiment, and the square is gleaming with pretty stars created with the Stitched Star STAX Die-namics. I love how she carried out the star theme in the background with the Starry Night Background Builder stamp. Kimberly incorporates patterned papers from the Off the Grid, Thick & Thin, and Tranquil Textures paper packs for her fun design. 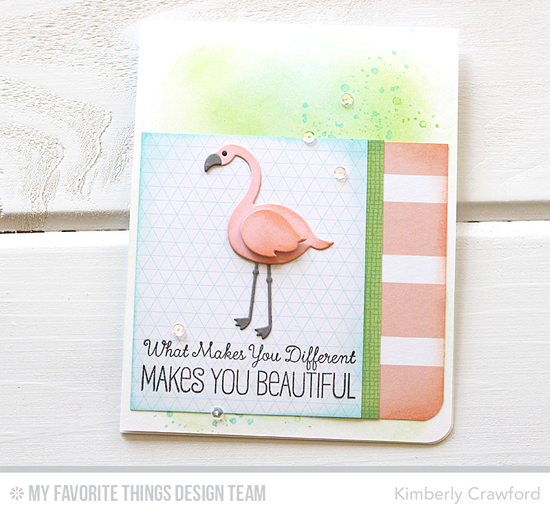 The line of the sketch is thinner to give space for her flamingo and the sentiment from the Tickled Pink stamp set. This card makes me feel like I've been whisked off to south Florida! Like Julia, Torico turns the sketch on its side, but the square is on the left for her rendition. There's a sweet sentiment accompanying the cute little scene she created with the Adorable Elephants stamp set. I love how she used the Swiss Dots Background stamp for the charming grassy hill, and the soft plaid patterned paper adds a delightful touch to her design. Our Guest Designer Amy Tsuruta is with us for one last time! 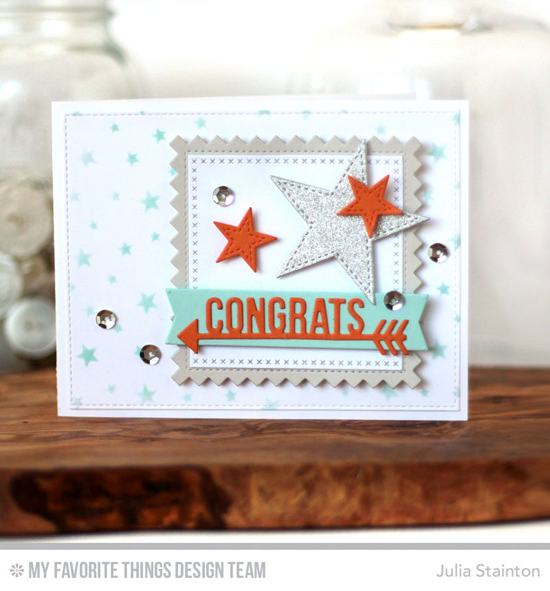 You can follow along with Amy at her blog Tsuruta Designs. 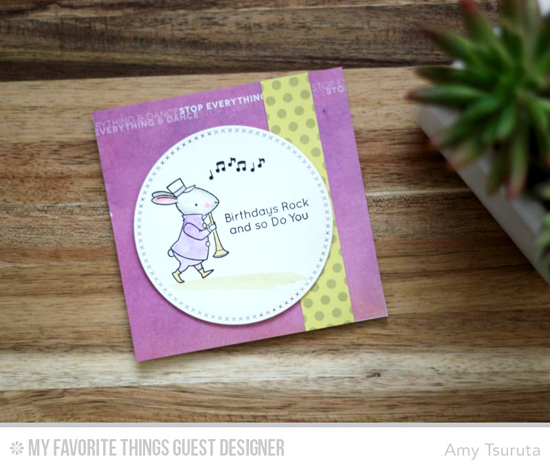 Let's see how Amy interpreted her last sketch with us as guest designer. Amy did something fun by eliminating the entire rectangle of the sketch and making her card follow just the square portion. 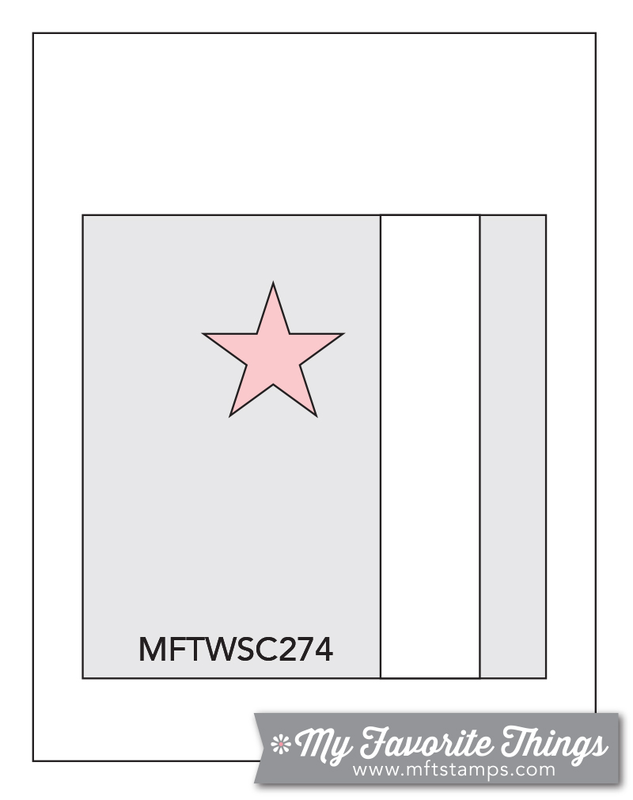 The star is replaced with a large circle to put the focus on the bugle flowing bunny from the Strike up the Band stamp set. Sometimes just a portion of the sketch can be the impetus for a great design! Jody draws inspiration for her color combination from the Plaid Patterns Paper Pack. 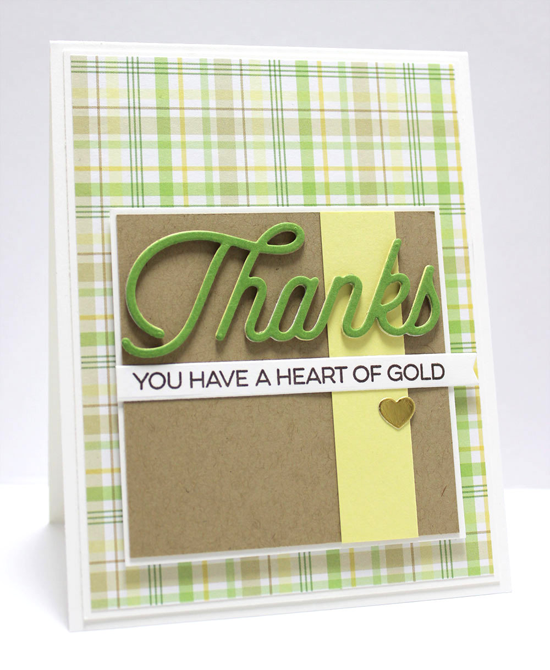 The square of the sketch looks almost like a gift box with the line of yellow intersecting with the sentiment strip. The bold thanks from the Twice the Thanks Die-namics is the focus of her design, and instead of a star, she accents the sentiment with a shiny gold heart. Barbara's focus is completely on the square with a pure white background. But on the square she makes a whole lot of magic! On the left she uses the Sun Ray stencil, in the middle she stamps white on dark with the Simply Fabulous Sayings stamp set, and on the right she creates a fun stripe with the Bold Diagonal Stripes Background stamp. 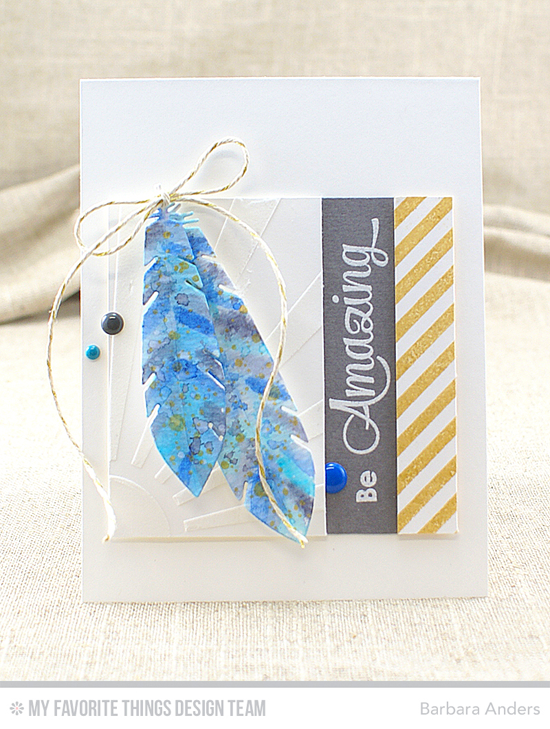 Two lovely feathers complement her design with delicious texture and interest. Congratulations, My Medley! You are the randomly selected winner of last week’s sketch challenge. You can view all the entries for last week’s challenge HERE. You have until Tuesday, April 5th, at noon EDT to add your link and be eligible for the prize of up to $20 in MFT Cash to be spent in the MFT boutique. Winners are chosen at random, so everyone has a chance! The weekly prize is a $15 Gift Voucher to My Favorite Things, but if you use MFT stamps and/or dies in your project, you’ll receive an extra $5. Woohoo! Thank you, MFT! I can't wait to go shopping! Love this weeks inspiration, and am looking forward to playing with this weeks sketch. Well said! :) Thanks for the challenge inspiration - I've been using your sketches for a long time and they always inspire me cards that I really love. Keep the fun coming! :) (And thanks for the time everyone puts in! I made it in! Thanks for the fun sketch challenge and the inspiration ladies!